Nine world championships between the two of them. Rivals only on the track. Red Bull Racing stole the front row in qualifying with Daniel Ricciardo ahead of Max Verstappen, but a poor start by the Aussie left him fighting for the podium during most of the race as his teammate led comfortably. Lewis Hamilton, who only had to finish seventh or better to secure his fifth Formula One championship title — or who simply had to continue to exist if Sebastian Vettel failed to win the race — didn’t take any risks today. He was unusually complaisant when anyone challenged him for position, and cruised to an easy fourth place finish after Ricciardo retired from yet another reliability issue (he’s now up to a whopping eight DNFs). 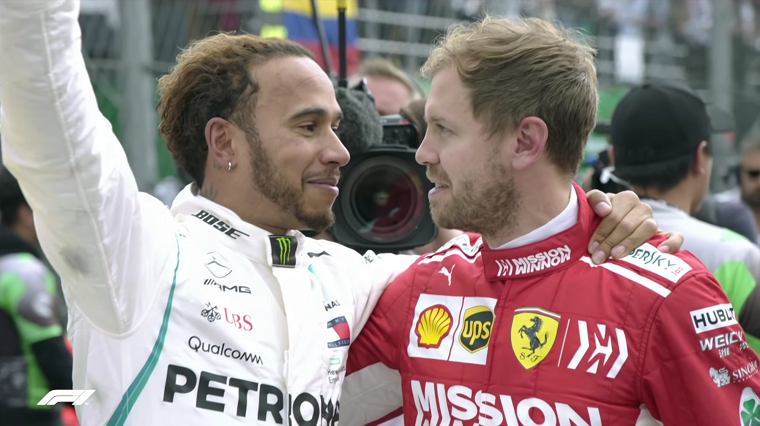 Sebastian Vettel finished second, which meant that his title challenge was officially over, and though he was visibly dejected he made a good show of sportsmanship after the race by giving Hamilton a congratulatory hug. Kimi Räikkönen finished third to help keep Ferrari in the constructors championship fight. 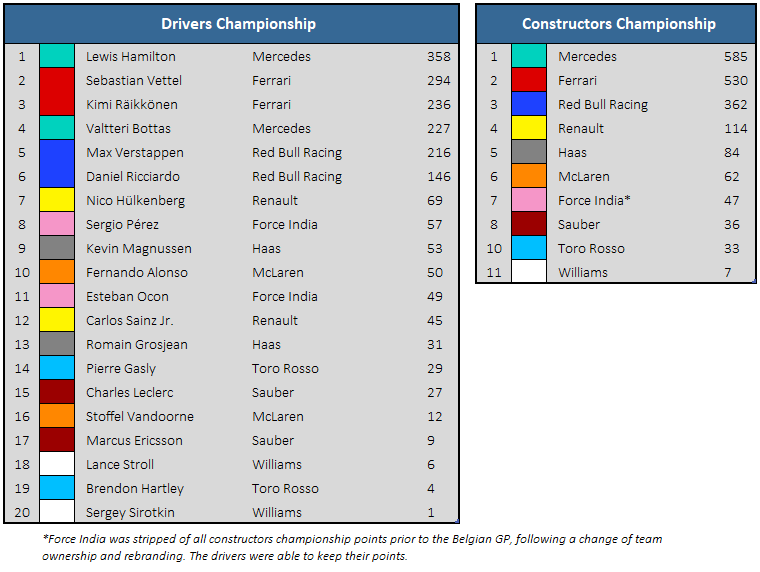 The Scuderia is 55 points behind the Silver Arrows, with a maximum of 86 to gain over the next two races. 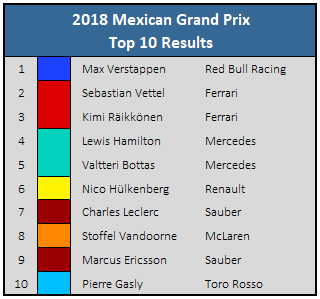 Behind the top three teams, Nico Hulkenberg once again came out on top of the unofficial “Formula 1.5” race, though only after teammate Carlos Sainz Jr was forced to retire from a reliability problem of his own..
Fernando Alonso also had to retire, though not because of a reliability issue but rather because of an unfortunate piece of debris that damaged his car on the first lap, despite his best efforts to avoid the midfield carnage. Because of it, he will now be unable to break Michael Schumacher’s record of most laps raced in Formula One, as he is moving on from the sport after the season and there are not enough laps remaining in the next two races. Though he won twice this year, Ricciardo has not been on the podium since the Monaco Grand Prix, while Verstappen has now reached it eight times in the same period. He’ll be looking to enjoy success with Red Bull one last time before he goes to Renault next year, and with the drivers’ championship now decided, he may well get his chance.